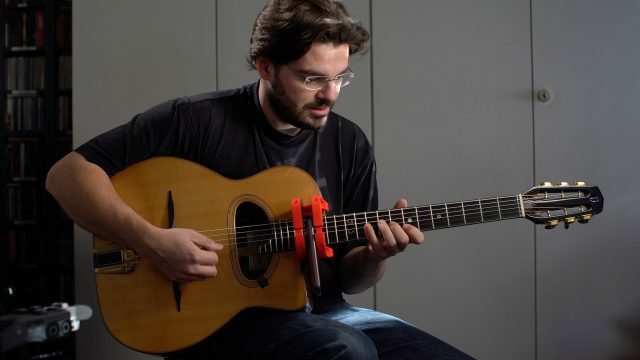 Joscho takes Gypsy founding father Django Reinhardt’s famous adaptation of downward pickslanting mechanics and enhances it with his own turbocharged take on high-speed playing. In the interview, we discuss the classic Gypsy flexed-wrist approach to forearm rotation, including a closeup look at Joscho’s amazing chord tremolo, multi-downstroke arpeggios and scales, and more. And we also discuss Joscho’s thoroughly modern two-way sweeping and legato passages that would be equally at home on any rock stage. With one foot in tradition and another in the stratosphere, Joscho is truly a Gypsy for the twenty-first century.